No, I don’t mean vampires in sandwich boards, although to be honest, if you’re targeting Millennials and can get a vampire or superhero link in, it might not be a bad thing. For this blog post though, there’s not a werewolf in sight. What I mean by twilight marketing is stepping outside that traditional 9 to 5 working day, and thinking about the marketing that goes on when you’re not around. In the good old days of course, we were less able to target specific times to market. If you sent our direct mail for instance, it arrived whenever the postman saw fit to deliver it, the timings where relatively outside your control. Nowadays it’s different. Nowadays we can time our digital marketing activities down to the nearest minute, so why in that case are so many brands still sticking to the 9 to 5 and missing a trick? The argument for marketing outside office hours is two fold. First up, your audiences are often just not as available during working hours. They have their own jobs to do after all, they can’t be wasting time clicking through from Facebook to read your latest blog posts. Early mornings and weekday evenings are normally good, as people are either commuting or at home. Weekends shouldn’t be forgotten about either. Imagine your own weekend – what’s the first thing you do when you wake up at around 9am on a Sunday morning? You lie in bed and have a look on Instagram don’t you? (That may be just me.) This Sunday morning slot has huge potential for a lot of brands, so don’t neglect it. 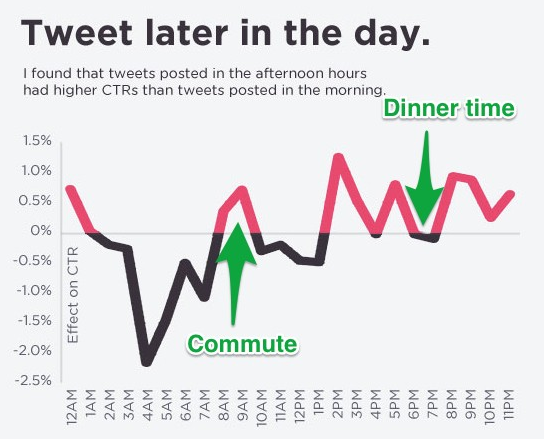 This post from Kissmetrics say that Saturday is the best day to post on Facebook for optimum engagement. When you send out your emails is equally important. 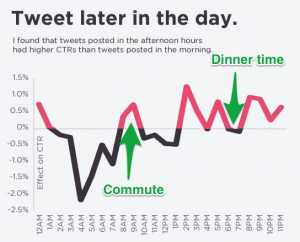 There’s some great data here from Dan Zarrella which essentially reinforces the trends we’ve talked about above – if you want to catch consumers when they aren’t distracted by other things, aim for the 7-10pm slot. Knowing this, you’d think that the most popular times to reach out to people online would coincide wouldn’t you? Right? Let’s take Twitter as an example. 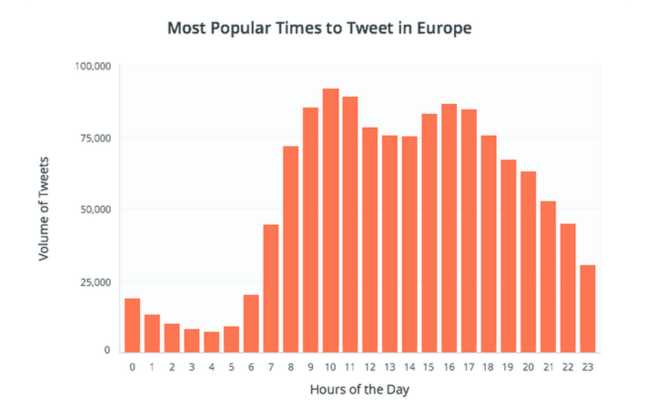 The most popular time to send a tweet in Europe is mid-morning or mid-afternoon, the times when actually engagement is low, as people are busy. 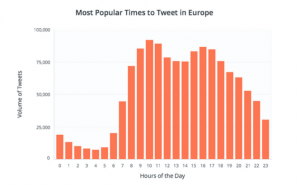 The ‘off peak times’ – early in the morning and late at night – are less popular, and so it follows that by jumping into these slots, not only will you be reaching a more engaged audience, but you’ll also face less competition from others tweeters. People’s timelines will be less crowded, and it’s easier to stand out. It’s interesting to think about this too in the context of Pay Per Click advertising. PPC works on an auction system, and so is dependent on competition. As a lot of PPC budgets are set daily, they’ve often been exhausted by the evening, providing you with an opportunity to jump in and get your clicks at a lower cost. Of course, as with all marketing, knowing your audience is key. A brand targeting working 30 somethings in London is likely to get a far better response at 8am, when everyone is on the bus on their way to work, than a brand looking to catch the eye of the student population. Test, test, and test again. Get to know your audience and their daily routine, and work around this – plan your digital marketing to fit your consumer’s timetable, not your working hours. Learn more tips at our Social Marketing track at our upcoming DMWF London event this June! 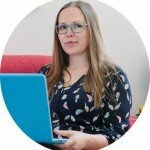 Jo Middleton has been working as a freelance writer, trainer and digital marketing consultant since 2009. She's the author of the multi-award winning blog, Slummy single mummy, and with a Twitter following of over 60,000, is proof of the power of social media.